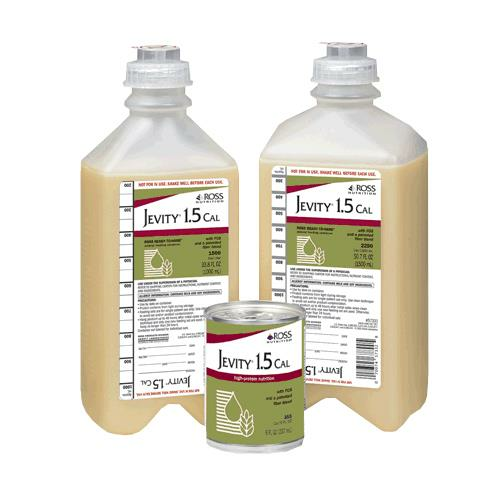 Abbott Jevity 1.5 Cal High-Protein Nutritional Drink With Fiber is a calorically dense formula with a unique fiber blend that provides complete, balanced nutrition. It is meant for tube feeding and for supplemental or sole-source nutrition. May be used for oral feeding of patients with altered taste perception. - Water, Corn Maltodextrin, Corn Syrup Solids, Sodium & Calcium Caseinates, Canola Oil, Corn Oil, Soy Protein Isolate, Fructooligosaccharides, Medium-Chain Triglycerides, Oat Fiber, Soy Fiber, Potassium Citrate, Calcium Phosphate, Gum Arabic, Sodium Citrate, Magnesium Phosphate, Soy Lecithin, Magnesium Chloride, Carboxymethylcellulose, Ascorbic Acid, Choline Chloride, Potassium Chloride, Taurine, L-Carnitine, Zinc Sulfate, dl-Alpha-Tocopheryl Acetate, Ferrous Sulfate, Niacinamide, Calcium Pantothenate, Manganese Sulfate, Cupric Sulfate, Thiamine Chloride Hydrochloride, Pyridoxine Hydrochloride, Riboflavin, Vitamin A Palmitate, Folic Acid, Biotin, Chromium Chloride, Sodium Molybdate, Potassium Iodide, Sodium Selenate, Phylloquinone, Cyanocobalamin, and Vitamin D3.